Beavertail Skiffs is a flats boat manufacturer based in Bradenton, FL. Beavertail Skiffs is a West Florida flats boat manufacturer and client of Thrive Creative Labs. Beavertail Skiffs’ boats are custom-built and tailored for shallow-water fishing. 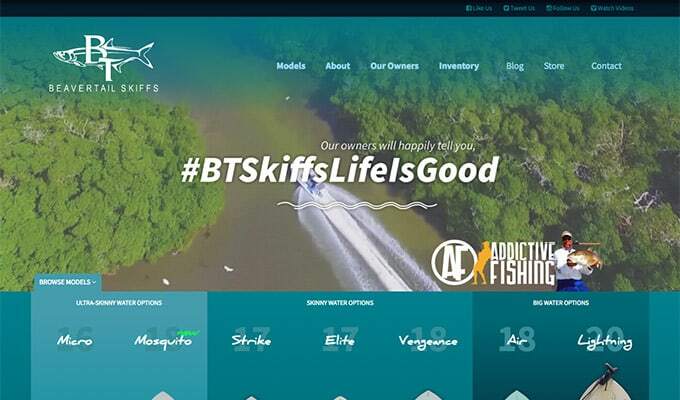 While I was only responsible for some of the digital property for Beavertail Skiffs, I was instrumental in the planning of a marketing plan, social media strategy, and a majority of the web design and development. The design itself – including color palette and layout – was created by me as an employee of Thrive. I came up with the idea of the top-down shots of the boats and map additions within the backgrounds and details of the design. The site has gone from an average of 50-75 daily visitors before the launch of the new site in February of 2016 to an average of 250 daily visitors. It continues to grow each month as new content is added to the site.